Thank you for choosing Wildwood Green as your golfing destination. We value our customers and want to make sure they are having the most enjoyable time as possible while here at the club. After our membership meetings in January we started an aggressive pace of play program that will track and record time spent on the course on a daily basis. 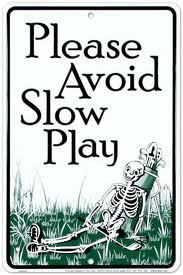 Please feel free to ask the Golf Shop for a pace of play sheet before you start your round. This will help track your time spent on the course and will help keep your pace on par with the course’s policy. *Please note that the pace times do not include time spent at the turn.